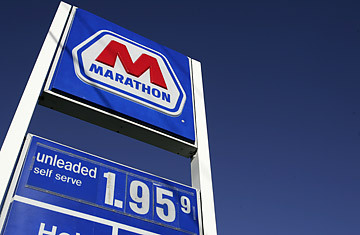 Gas prices below $2.00/gal. are posted at a Marathon station in Brownsburg, Ind. With the economy in the U.S. "contracting significantly" in the fourth quarter, as San Francisco Fed president Janet Yellen recently put it, an issue that was practically unthinkable three months ago is now, for the Fed, front and center: the possibility of the U.S. entering a phase of deflation, or protracted declines in the general price level. In its statement accompanying the most recent interest-rate cut, the Fed said, "In light of the declines in the prices of energy and other commodities and weaker prospects for economic activity, [the Fed] expects inflation to moderate." The good news is that in the U.S. now, as Richard Berner, chief U.S. economist for Morgan Stanley, writes, "The ultimate bastion of defense against deflation is a Fed committed to avoid it at all costs." And that's what we have. Study of the Japanese experience became something of a cottage industry for Fed researchers over the past eight years, and the Fed has responded accordingly: lending directly to banks, backstopping the commercial-paper market (which companies use to raise short-term money), trying to bring yields on both long- and short-term maturities down. Further, Fed chairman Ben Bernanke went out of his way recently not to object to the possibility of further fiscal stimulus from Congress. In other words, the Fed is throwing everything but the kitchen sink at avoiding a deflationary spiral, and it's doing so more quickly than its counterparts in Tokyo did a decade ago. Disinflation  diminishing inflationary pressure across the board  is healthy for the U.S. economy. Deflation is something the U.S. doesn't want to see. And the Fed knows that better than anyone.